Surrey Police are pulling out of plans to privatise parts of their services amid doubts over the venture's future. The county's police authority had already suspended its involvement in July, when members voiced reservations about one of the partner groups, G4S. The security firm failed to provide the agreed number of staff at the Olympics. But the authority says a key factor was also a lack of support from candidates seeking election to run the force as police commissioner later this year. Surrey Police Authority had been considering joint plans with the West Midlands force to contract out some "middle and back-office functions" to private firms - including G4S - as it looked to cut its budget. But it confirmed its decision to withdraw from the Business Partnering for Police Programme at its September meeting, formalising July's suspension. The Unite union welcomed the decision, saying: "Good sense and wisdom has prevailed over sheer madness." At the July meeting, police authority members decided they should not commit further taxpayers' money to a project that looked unlikely to be backed by Surrey's first police and crime commissioner, as most candidates had expressed their opposition. It deferred a final decision until the September meeting so that it could assess the legal and financial implications of pulling out. 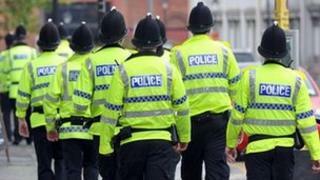 West Midlands Police Authority agreed to a similar deferral. The Surrey authority has pledged to continue finding ways of improving efficiency to achieve budget savings. Chief Constable Lynne Owens has vowed to "continue to look at opportunities to collaborate with other police forces and develop relationships with other public services". Unite national officer Peter Allenson said: "The fiasco at the Olympics caused by G4S was a warning of the potential disastrous consequences of privatising parts of the police. "The Surrey Police Authority has made a wise decision. We now expect the West Midlands Police Authority to do the same." Following Surrey's announcement on Thursday, West Midlands Deputy Chief Constable David Thompson said: "We acknowledge and respect the decision made by Surrey Police Authority today. "The force remains committed to developing the work on BPP in preparation for the new police and crime commissioner in November." What is G4S and how will Olympic problems affect it?